Sometimes being alone is not being lonely. My kind of party featuring furniture from Raindale. Laverton Gacha items & Larmare Bar Stool! ⚪ Raindale Laverton Gacha & Larmare Bar Stool. Laverton Gacha at Lootbox until January 28. The Laverton Lootbox has a Rare Skybox, Black Hanging Chair with animations and Gold Wall Art Branches with 2 mirrored pieces. There are also 10 common items which include Grandfather Scripted Clock in 2 colors, Black & White Wall Art Branches, Hanging Chair in White, Mirror in Black & Gold, Armoire and Chair in 2 colors. You can modify all items. This gacha is 50L$ per play. Larmare Bar Stool at The Liaison Collaborative until January 26. Larmare Bar Stool colors can be changed by touch. Options between 5 leather and 5 metal colors. It also has 12 solo sits animation and 10 static poses that can also be adjusted. Permission are Copy/Modify/NoTransfer, the price is 150L$. Other Raindale furniture I am using in this post: Cranbourne fireplace (dark + firewood), Lovington Wall Signs/Coffee Table/ Rug/Table Lamp/Frames/Wall Sconce & Gracewood Rug. Mainstore ‖‖ Marketplace ‖‖ Flickr ‖‖ Flickr Group ‖‖ Blog. Head: Azoury by Mayhem Seetan – Nicodeme Robotic. Kimono: United Colors by Unitedcolorsteam – Misa. Shoes: Garbaggio by Ashleey Andrew – Rachel Sandals. Plants: The Cube Republic by CubeRepublic – Spider Plants. 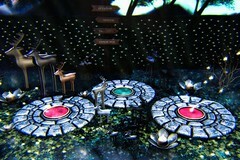 Bunnies/Cat/Lights: +Half-Deer+ by Halogen Magic- Cozy Stringlights Draped I/Secret Garden Bunnies/Cozy Cat. Bar: Death Row Designs by Deathrowdesigns – Garden Party Beer Bar & Desert Table. Vase: ARIA by Yelo Uriza – Eirwen Bud Vase.